Dazee has been flying the flag for Jungle and DNB since 1992 and is co- founder of the now legendary 'Ruffneck Ting' alongside Markee Substance (Kosheen). 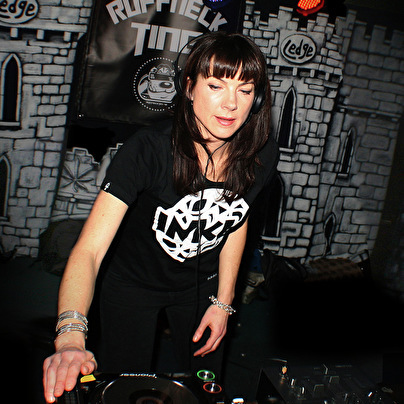 As well as making a name for herself with her dj skills, she has had many successful releases; labels include Ruffneck Ting, Breakbeat Culture, Siren Records and Universal. She's performed at the most celebrated raves and jungle parties (and featured in the tape packs!) including Universe, Dreamscape, Helter Skelter, World Dance and more recently, Raveology, Slamming Vinyl and Fantazia. Her pioneering dnb sound has taken her around the globe and she has Featured on Radio 1, BBC 1Xtra, VH1 and ITV. Dazee currently co-hosts The Dutty Bass show on Bristol's much loved Ujima FM, along side her fellow "Dutties" As a member of Dutty Girl, Dazee is diversifying her sound to include a variety of bass heavy dance genres. Dutty Girl's unique blend of mixing through genres and featuring their own productions and original vocal tracks can be heard on their "Call of Dutty Cd" as well as in their performances.